It’s been a very long time since The Movie Mind has left a movie theater giddy like a little kid and grinning ear to ear. It has been even longer since I left a theater and wanted to go right back in and watch the movie again. That is exactly how I felt after happily playing a part in making The Dark Knight the fastest movie ever to gross over $300 million (10 days, to be exact). This was one of the best films I have seen in a long, long time, and should be a shoe-in for Best Picture at the Oscars. I simply can’t imagine what a better film would look like, and how it could possibly surpass what The Dark Knight was able to accomplish. Allow me to temper my reaction with my expectations going into this film. I intentionally boycotted the opening weekend due to my 2-hour rule for films; The Dark Knight surpassed that by an easy 30 minutes. I was initially dreading having to sit in a theater for yet another director’s overindulgent, drawn-out feature. While I can say that this movie was definitely 20 minutes too long, it clearly did not spoil my taste for it. The other component to my being skeptical of the raves and high praise for this film billed as the second-coming had to do with the Heath Ledger tragedy. I was uncomfortable from the beginning about how the film was marketed and promoted, no matter how many times the studio talked about “class” and “good taste”. As a matter of fact, I wasn’t even sure that Batman was actually in this film until I sat in the theater and saw him for myself. It was just creepy to me how people ogled over Ledger’s last living testament and propped him up on a pedestal, since that’s how they rationalized their sheer morbid curiousity. No matter how much people claim they went to see this in Ledger’s honor, I am saddened to believe the vast majority had a more selfish motivation. Nonetheless, I feel completely comfortable saying that he deserves all the praise he gets…and then some. I can only hope to say he would have still received the same amount of applause if he was still with us. He would have from The Movie Mind. We return to the streets of Gotham, in better shape than ever thanks to a fear in the eyes of the underworld, provided courtesy of Batman. Christian Bale is stellar once again as the crass socialite Bruce Wayne, and more convincing than ever as the city’s hero of the night. Batman’s lone soldier in the war against Gotham’s underbelly is Lt. James Gordon (Gary Oldman), who has already earned the trust of the hero. They have made real progress cleaning out the crooked cops, politicians, and bad guys but they feel like they can rid Gotham of these criminals for good thanks in large part to hard-hitting District Attorney Harvey Dent (Eckhart). Batman is not sure just yet about Dent’s intentions and trustworthiness, but he will soon find him to be another ally in his small army. Dent’s no nonsense approach to taking down organized crime has made the criminals resort to hiring some “outside help” they didn’t think they wanted, nor were they aware they needed it. Their only hope, as they are so told, is to hire someone who does not believe in honor or rules. A person who only believes in mayhem for the sake of inflicting pain. Aptly put by The Joker himself, he is the “better class of criminal this city deserves”. While these crime syndicates resort to “outsourcing” their money laundering scheme overseas, they forget Batman has no jurisdiction. He has put their operation in shambles, which leaves a big opening for the wise-cracking madman in makeup to make a forceful statement. The reason The Joker comes out so successful can be attributed to a brilliant performance by Ledger, clever writing, and the creation of a new breed of bad guy. Ledger takes the fictional character and turns him into a real-life psychopath that relies less on typical comic-book villain tactics, and more on the methods of your modern day serial killers. And somehow he manages to do it with a memorable grin and sadistic wit. I for one do not believe that Ledger’s performance will erase the thought of a smiling Jack Nicholson in the original Batman. While both managed to be thoroughly entertaining and quite witty and funny for bad guys, I just don’t think it’s fair to compare the two. Nicholson played a cartoon character who was as loud a personality as the man himself, while Ledger took the comic-book villain and created a living nightmare. He turned The Joker into the worst combination of criminal and killer and convinced us that he could actually exist in today’s society. In fact, this is what made The Dark Night a great movie. Batman no longer lives in a superhero fantasyland that thrives on an audience of Trekkies. He is a living, breathing, flesh and blood man doing battle with the worst kind of man there is. We believe the story as if it was real, and that is difficult to do in a film based in this genre. It is an even more challenging feat when characters such as Batman and The Joker have been so deeply imbedded in our minds as cartoon characters. As always, there are a few things that could have been slightly better. I already mentioned the length of the film, and while I wasn’t bored at the least, the story could have ended at the 2-hour mark with the added bonus of a nice leave behind for the next film. I thought the last 30 minutes of the film could have been expanded into a brand new feature down the road, but kudos to the writers for at least attempting to wrap it all up. The biggest mishap was the casting of Maggie Gyllenhaal as duel-love interest Rachel Dawes. I hate to say Katie Holmes outshined anybody, but in this case it was true. Other than that, there was a small error that even IMDB’s goofs section didn’t catch (that noise is The Movie Mind patting himself on the back) where we get a clear shot of Bruce Wayne’s Lamborghini donning an Illinois license plate. Apparently Gotham City moved out to the Midwest. I hear land is much cheaper there. Still, I’m picking at straws here. This was an amazing film that should stand the test of time. Christopher Nolan (Batman Begins, The Prestige) may have maintained a fairly ambiguous profile as a director prior to The Dark Night, but something tells me come Oscar time we might see a lot more of him. You would be crazy for missing this one on the first pass. If it is fortunate enough to break the $600 million record set by Titanic, it will mark a milestone for a film’s financial success matching its cinematic value. Interesting Cameo Appearance: Tommy “Tiny” Lister aka “Zeus” (better known as Debo, the massive bald-headed bully from Ice Cube’s Friday and sequel Next Friday) as a prisoner realizing his fate and making a noble, if unpopular, choice. Alfred Pennyworth: You crossed the line first, sir. You squeezed them, you hammered them. And in their desperation they turned to a man they didn’t fully understand. Harvey Dent: The famous Bruce Wayne. Rachel’s told me everything about you. Bruce Wayne: I certainly hope not. Gotham National Bank Manager: The criminals in this town used to believe in things. Honor. Respect. Look at you! What do you believe in? What do you believe in! 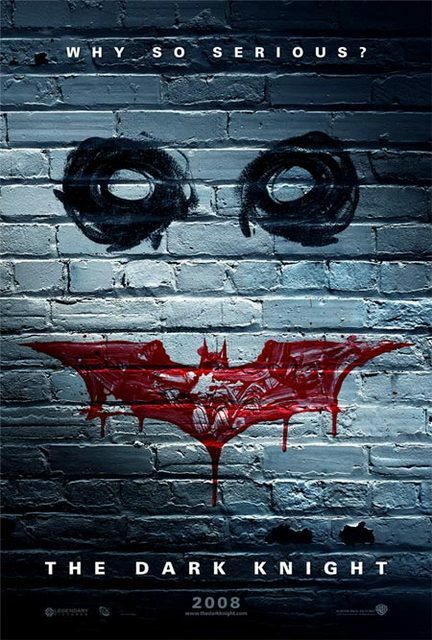 The Joker: I believe whatever doesn’t kill you simply makes you… stranger. The Joker: This town deserves a better class of criminal… and I’m gonna give it to them. Harvey Dent: You’re Alfred, right? Alfred Pennyworth: That’s right, sir. Harvey Dent: You’ve known Rachel her entire life. Alfred Pennyworth: Not yet, sir. Harvey Dent: Any psychotic ex-boyfriends I should be aware of? Alfred Pennyworth: Oh, you have no idea! Bruce Wayne: You know that day you once told me about, when Gotham would no longer need Batman? It’s coming. The Joker: I took Gotham’s white knight, and lowered him to our level. It wasn’t hard. Y’see, madness, as you know, is like gravity. All it takes is a little…push. The Joker: Do I look like a guy with a plan? Lt. James Gordon: Because he’s the hero Gotham deserves, but not the one it needs right now…and so we’ll hunt him, because he can take it. Because he’s not a hero. He’s a silent guardian, a watchful protector…a dark knight. The Joker: We really should stop fighting, we’ll miss the fireworks! The Joker: The only sensible way to live in this world is without rules! The Joker: Wanna know how I got these scars? The Joker: You’ll see, I’ll show you, that when the chips are down, these uh… civilized people, they’ll eat each other. The Joker: You see, nobody panics when things go according to plan. Even if the plan is horrifying. If I told people that a gangbanger was going to get shot, or a busload of soldiers was going to get blown up, nobody would panic. Because it’s all part of the plan. But tell people that one tiny little mayor is going to die and everyone loses their minds! James Gordon Jr.: Did Batman save you? Lt. James Gordon: Actually this time I saved him. Lt. James Gordon: We’ll have to hunt you. Batman: You’ll hunt me. You’ll condemn me, you’ll set the dogs on me. But that’s what has to happen. Bruce Wayne: What about getting back into the plane? Lucius Fox: I would recommend you find a good travel agent. Bruce Wayne: Without it landing. Lucius Fox: Now that’s more like it, Mr. Wayne. Alfred Pennyworth: Know your limits, Master Wayne. Bruce Wayne: Batman has no limits. Alfred Pennyworth: But you do, sir. Bruce Wayne: Well, can’t afford to know them. The Joker: You just couldn’t let me go could you? This is what happens when an unstoppable force meets an immovable object. You truly are incorruptible aren’t you? You won’t kill me out of some misplaced sense of self-righteousness, and I won’t kill you, because you’re just too much fun. I think you and I are destined to do this forever. The Joker: Maybe we can share one. Then we’ll be doubling up the rate this city’s inhabitants are losing their minds. Lucius Fox: Yes, three buttons is a little ’90′s, Mr. Wayne. Lucius Fox: I’m not talking fashion, so much as function. Bruce Wayne: Why don’t we put some tables together? Harvey Dent: I don’t think they’ll let us. Bruce Wayne: They should…I own the place. Salvatore Maroni: If you’re trying to intimidate someone, you should pick a better spot. From here, the fall wouldn’t kill me. Batman: I’m counting on it. Lucius Fox: Let me get this straight. You think that your employer, one of the wealthiest, most powerful men in the world, is spending his nights running around the city beating criminals to a pulp with his bare hands. And your plan is to blackmail this person? Good luck. Batman: Why do you want to kill me? The Joker: Kill you? I don’t want to kill you! What would I do without you? Go back to ripping off mob dealers? No, no, you… you complete me. Alfred Pennyworth: Endure, Master Wayne. Take it. They’ll hate you for it. But that’s the point of Batman, he can be the outcast. He can make the choice that no one else can make, the right choice. The Joker: Let’s turn the clocks back. A year ago, these cops and lawyers wouldn’t dare cross any of you. I mean, what happened? Did your – did your balls drop off? Hmm? The movie was awesome!! !My only complaint is that Bale needs to tone down the over the top Batman voice. Best movie I have seen in many years. It was dark, & real. Film making at its finest. Great review Movie Mind.